Twins Shimmer and Shine are genies-in-training who grant wishes for their best friend, Leah. The wishes don't always go as smoothly as they plan, though -- after all, they're still in training -- and the girls must clean up the magical mess that results from the issues. One of the most popular shows on Nickelodeon for preschoolers, we have a great range of shimmery colour and activity product. Come have some sparkly fun with Nickelodeon’s twin genies, Shimmer and Shine. They can finally grant wishes and their genie bottle is ready! When they meet Leah, what magical fun will they get up to? Shimmer and Shine are genies-in-training but their wishes don t always go to plan. But together, they always work things out because they make a great team! Children will love this bumper colouring book, that features loads of pages to colour. Shimmer and Shine are twin genies in training! But their wishes don t always go to plan What magical misadventures will they get up to today? This giant activity pad is packed with pages to colour, as well as 50 stickers. Meet Shimmer and Shine! The two girls have just become genies and they are ready to grant three wishes a day! Leah is the lucky girl to find their genie bottle. Read what magical mischief these two get up to with their friends. This box is packaged with six paperback storybooks for you to enjoy, each featuring a new magical adventure. It’s Shimmer and Shine’s wish-aversary with their best friend Leah, and they want to make her a special gift. Does the gift-making go to plan? No matter what, they always work things out together because they make a great team! Children will love this book that features a lovely narrative, with loads of pages to colour. Shimmer and Shine’s wishes don’t always go to plan Come have some sparkly activity fun with Nickelodeon’s twin genies, Shimmer and Shine.Featuring fun pages to colour, plenty of engaging games and exciting activities! 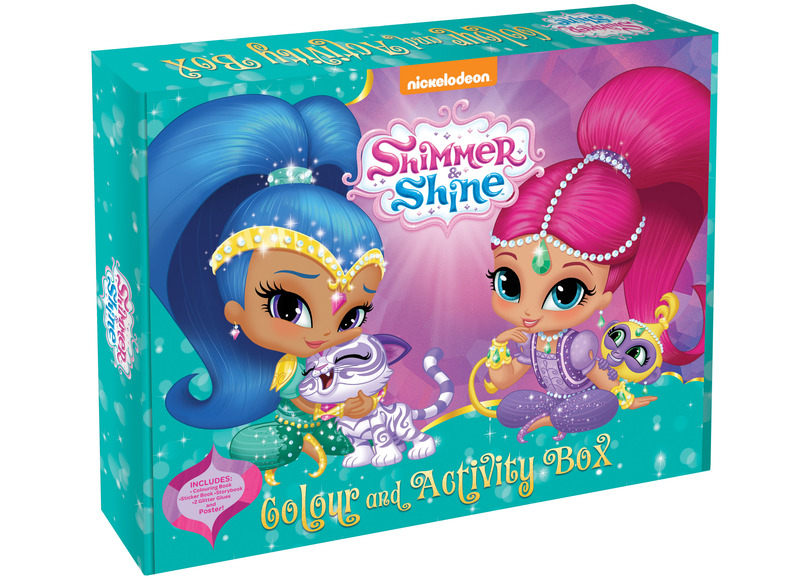 Shimmer and Shine are twin genies- in-training and their wishes don’t always go to plan This activity box includes a 24-page colouring book, a 16-page sticker activity book and a 24-page picture storybook. Also included is a wall poster with a positive message, and two glitter glues. The fabulous twin genies of Nickelodeon’s Shimmer and Shine introduce colours in this sturdy board book that’s perfect for boys and girls ages 0 to 3.